President Barack Obama made news on December 2 when the White House announced his signature of an order titled, “Improving American Indian and Alaska Native Education Opportunities and Strengthening Tribal Colleges and Universities”. The order is meant to improve educational performance for Native American students from early education through college. School results among children from these communities are often very low. The signing was done in conjunction with Obama’s third White House Tribal Nations Conference, which saw hundreds of tribal leaders gather at the Department of the Interior’s headquarters. 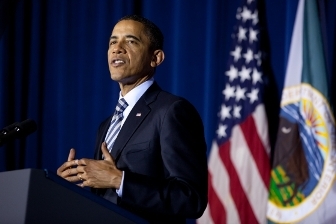 “We’re going to find ways to reduce the dropout rate,” Obama declared. “We’re going to help students who’ve already dropped out re-enter the education system. And we’re going to strengthen our tribal colleges and universities. They are cornerstones of their community and they deserve our support.” The crowd applauded loudly as Obama announced the signature. The Order notes that “many Native languages are on the verge of extinction”. “My administration will … help ensure that American Indian and Alaska Native have an opportunity to learn their Native languages and histories”, Obama stated. The Order details a good number of objectives and action to put in motion, though never mentions the financial resources allocated to this ambitious endeavor. The only hint is that an executive director will be appointed. Whether he’ll be provided with a sufficient amount of resources to lead such an initiative in the middle of global financial turmoil, is yet to be defined. Read Indian Country Today article.